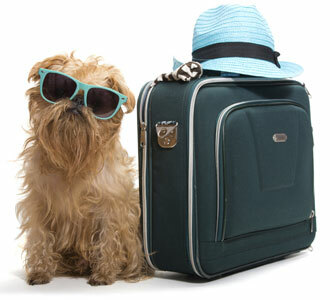 Whether you leave Rover home or bring him on vacation, plans for your trip should be made well in advance. • Is your pet friendly? • Is he (she) over-friendly? Sometimes a large over-friendly dog appears aggressive and scares people. • Does your dog jump up on people? If so, he (she) can easily knock down and injure a small child. • Is Rover extremely territorial? If you are planning a camping trip, remember that campsites are located close to each other. There are no walls or fences that separate adjacent campsites. • Does your dog bark when he (she) hears strange noises? When away from home, many new noises are considered "strange" noises. Barking is extremely annoying to neighbors. • Does Rover obey your commands? Does he wander from home? Spending an entire day (or several days) chasing after Rover is no fun. If you would like to bring Rover on vacation, planning is necessary. • Rover must be current on all vaccinations, including Rabies. If you do not have vaccination certificates, call your regular veterinarian and request copies. If you are traveling to another state, you may want to call your state veterinarian's office. Your state veterinarian may provide you with additional information or requirements that are necessary for traveling with Rover. • Make sure you have an adequate supply of heartworm medication as well as a supply of any other medication that Rover is taking. If Rover is taking prescription medication, carry a copy of the prescription. A copy of his (her) medical record may be useful as well. • A strong collar (and leash) with identification tags is necessary. The tags must have an address and phone number. Since you are on vacation, the phone number should be a friend's number or the phone number of your veterinary hospital. A second collar with an additional set is useful if the original is lost. • Rover's picture should be in your wallet. A current photo of your dog comes in handy if he/she gets lost. • A travel crate or kennel (well ventilated) is necessary. A large bag of Rover's food may be easier to purchase at home than on the road. If he (she) is eating a special or prescription diet, you may have a difficult time purchasing this particular brand away from your home. Motels, inns, and campsites must be called in advance. Many accept pets, some welcome pets, and most refuse pets. Some motels, Inns, and campsites have limited space for families with pets. These are often booked before tourist season even begins. Make these reservations early! Check with your local American Automobile Association for motels, inns and campgrounds that accept pets. The Internet is an excellent method for finding lodging as well.